A festival or holiday like Cinco de Mayo or Day of the Dead, Dia de los muertos. Some North american traditions. Celebrating Cinco de Mayo this year? Let us help you out with Happythought’s fabulosos Cinco de Mayo printables, inspired by the wonderful imagery and colors of Mexico. The kit is ready to instantly download, print & create. We strive to make our kits as easy and as fun to make as possible, so all you will need is a printer, scissors and a glue stick! Our Happythought blog is packed with fun tutorials, ideas and more information about Cinco de Mayo and why we celebrate this fun fiesta. • Party invitations and envelopes to invite your guests to a party! • Colorful chili & lime garlands to hang in your party, bedroom or work space. • Lucha Libre masks to cut out and make, also a coloring-in version. • Mexican moustache and sombrero photo props to get great party pics. • Mexican Loteria or bingo to play with your guests. • Cinco de Mayo cute play figures. • Cupcake toppers and wrappers featuring moustaches, pinata donkeys and sombreros for your homemade or store bought cupcakes. • Mini popcorn boxes to fill with yummy popcorn. Cute drinking straw flags. • Wine and beer bottle ponchos and sombreros. • Pinata template and tutorial – make an individual pinata for each of your guests, or have them make their own! Our printables come with full assembly instructions. 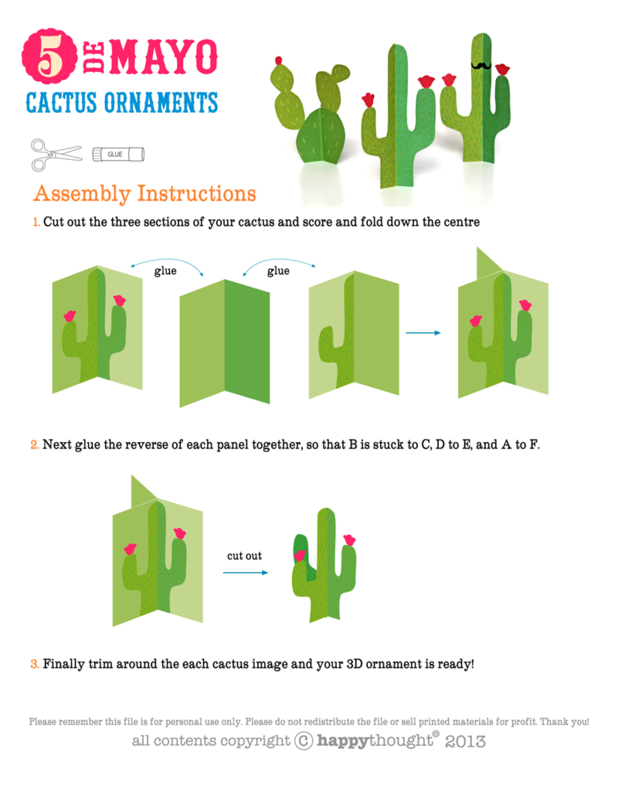 See an example of our printable cacti instruction sheet. Featured on our blog happythought.co.uk are some great video/photo tutorials plus loads of great free party printables, tips, advice and some gentle encouragement! 2. Use a craft knife or the back of a butter knife to score folds before putting together your party kit. 3. Allow yourself plenty of time to cut out and put together your party kit.